The artists and curators wanted to temporarily transform the existing gallery space in the Mermaid, if at all possible. The people at Mermaid Arts Centre were up for this. This project, therefore, is about building within a building and altering. 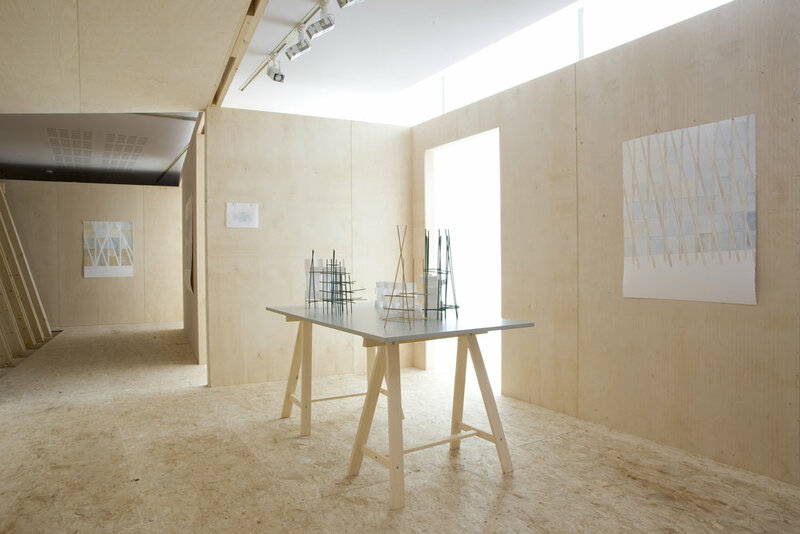 It is also (ultimately) about unbuilding as this structure was designed to last only the eight week duration of the mini-series of exhibitions (although this meaning of unbuilding is not necessarily that of the art project title). However, due to the popular response, the architectural intervention has been retained. Perhaps as a riposte to a possible critical reading underlying the project’s title ‘unbuilding’, this piece of architecture is also a little bit about re-affirming architecture’s purpose. It aims, within an economy of means and in a collaborative way, to trigger a heightened spatial and sensory experience for the visitor while meeting the fluid requirements of the brief. 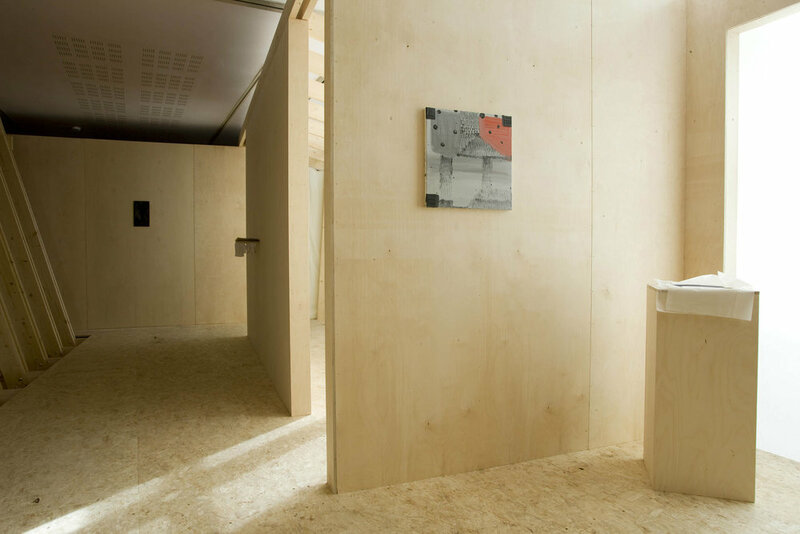 It also explores the potential for architecture to engage with the temporary, the provisional, to enjoy the creative freedom which this can sometimes bring and the value of a temporary re-imaging of existing buildings and spaces to allow for expanded and altered use and engagement. We developed initial concepts in collaboration with all the artists and curators. They were our clients and each artist had particular requirements for a particular setting. We designed a framed structure of multiple trusses made out of standard timber sections which sit within the main gallery space. The frame allows for some adjustment between shows in this rotating series of mini-exhibitions. A translucent muslin fabric runs across the large south facing window of the main gallery space. This allows light in, while screening off the visually dominant window frame. A new ‘floor’ floats over the existing: an essential structural device and the gentle rise and change in surface material and colour become a critical part of the experience of transition. The varying intensities of truss spacing disrupt the long low line of the existing ceiling. The structure exerts its presence over the stairwell to create a sense of ‘entry’ as the visitor moves from ground to upper – gallery – floor level.